Lieutenant Terence McDonagh (Nicolas Cage) shuffles along with a stooped gait, one lop-sided shoulder blade jutting grotesquely skywards. Wearily fighting back the urge to scream from every piercing sting emanating from his chronically injured back and bearing a facial expression that’s twisted into a clammy, rat-like mask, he hides his racked lanky frame under an ill-fitting grey suit which messily hangs open in the front so as to reveal the comically bulky revolver tucked into his belt. Tasked with leading a team (which includes Val Kilmer, Shawn Hatosy, and Michael Shannon) in discovering the culprit behind a horrific drug-related gangland slaying, McDonagh more closely resembles a br ain-deteriorated zombie from a Romero film than an upstanding member of his impoverished New Orleans community. 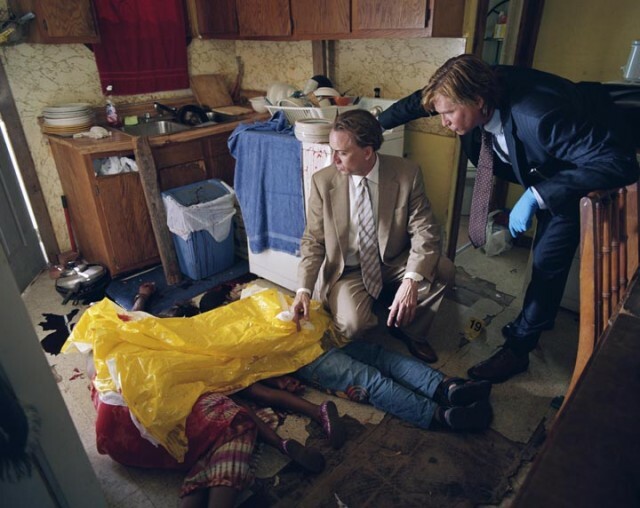 Subsisting on an endless stream of pain medication and narcotics, all he desires is to get high with his prostitute girlfriend Frankie (Eva Mendes) and close the book on the messy homicide case. If only those pesky iguanas would just stop staring at him, he’d be able to concentrate. 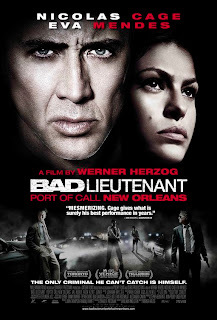 And so it goes in The Bad Lieutenant: Port of Call New Orleans, director Werner Herzog’s off-the-wall spiritual remake of Abel Ferrara’s gritty 1992 cult hit (perhaps best remembered for the chill-inducing scene wherein Harvey Keitel sexually as saulted a quivering, teary-eyed pair of teenage girls with little more than cruel, coarse words and commanding menace) that dares to turn its protagonist’s reckless, tortured journey into a blackly funny cosmic joke. The celebrated German auteur isn’t remotely interested in crafting a by-the-numbers procedural, where good triumphs through determination and proper ethics. No, he’d rather follow McDonaugh into the muck, tenaciously observing, without judgment, the junkie lawman undergoing his dismal daily routine; crudely shaking down intoxicated club kids for drugs, betting away his life savings on college football games — much to the chagrin of his frustrated, unpaid bookie Ned (a nicely understated Brad Dourif) — and terrorizing suspects and their families for vital information. As embodied, gnarled body and crazy soul, by Cage — in his best performance since 2002’s Adaptation — McDonagh is a truly original creation; a man whose demons have been driving him so long that he wouldn’t know what to do without them. In one of the film’s best scenes he attempts, while blitz ed on heroin, to shakedown one of his girlfriend’s clients for cocaine. Using his perpetual hangdog expression to its full electric elasticity, Cage browbeats the man with sullen lids, eyes bleary, only to triumph when his opponent throws up his hands in exasperation and, head shaking, exits the scene. Don’t let the massive handgun fool you: McDonagh couldn’t be more impotent, not only authoritatively, when he irately confronts an abusive John (hilarious scene stealer Shea Whigham); but also sexually, especially during a pathetic liaison with a former partner (Fairuza Balk). 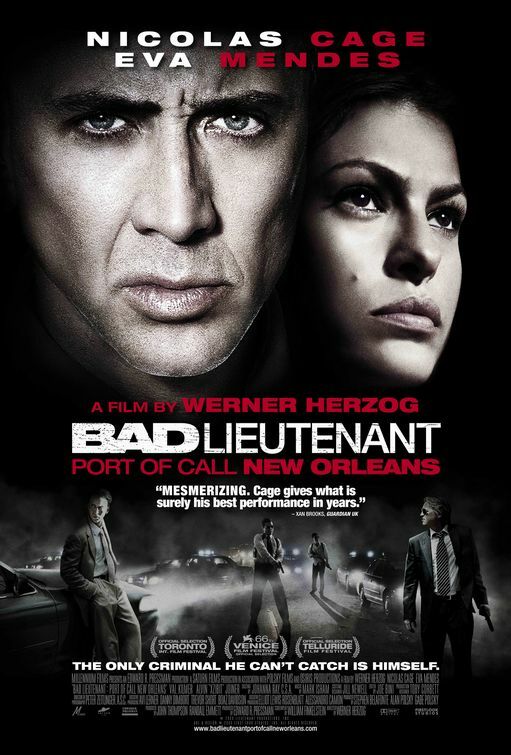 Occupying a New Orleans which is perpetually overcast with grey clouds — symbolic of both the morality of the protagonist as well as his consistently down-in-the-dregs mind-set — Herzog fills The Bad Lieutena nt’s sad world with ramshackle architecture and dirty little touches suggestive of a crime-infested wasteland, where everyone’s scrambling hand-overfist to feed some sort of addiction. Only the quiet, unkempt country home of Terence’s recovering alcoholic father Pat (Tom Bower) offers any hope for rehabilitation, and even it has its own resident unstable force in the form of Pat’s perpetually drunk, sad-eyed lover Genevieve (Jennifer Coolidge, in a very strong noncomedic turn), who understands Terence’s plight even if she can’t quite form the words to communicate it. 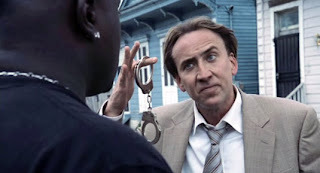 Although the film has a propensity for merrily flying off the rails in spots (the price of channelling insanity, I suppose) and Cage’s inconsistent accent draws some raised eyebrows, Bad Lieutenant: Port of Call New Orleans deserves attention purely for being, hands down, this year’s most skilfully chaotic nuts-o gem. It’s a sweat-stained cinematic trip that, with Herzog and Cage proudly on duty, feels dangerous and bracing. 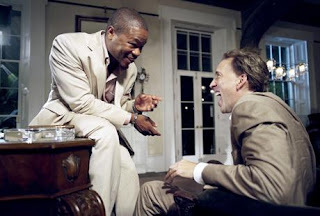 So, don’t be too surprised if you feel a little numbed and dopey yourself when the film reaches its brutal conclusion. Just watch out for stray iguanas. *Originally printed in SFU's The Peak: Nov. 30th, 2009.